As of Friday night, the Camp Fire has killed at least nine people and destroyed 6,713 buildings in the Northern California city of Paradise, but those numbers could still increase as officials continue their surveys. It’s now the most destructive wildfire in state history. In Southern California, low humidity combined with strong offshore Santa Ana winds prompted the National Weather Service to issue an “extremely critical” fire weather alert, its highest warning for wildfire risk. 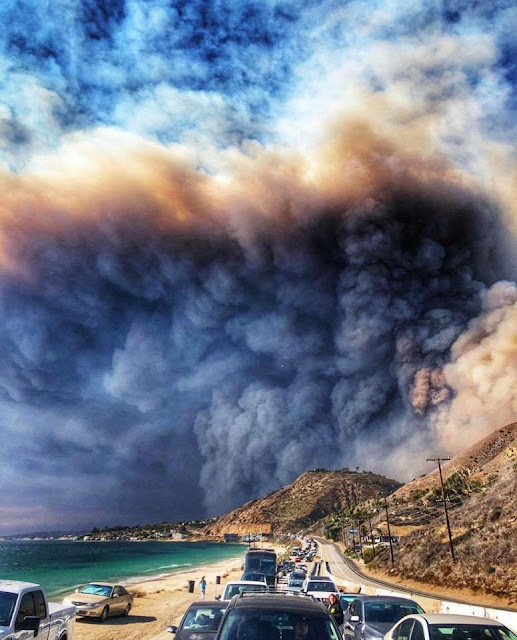 Two fires there are rapidly expanding towards the coast causing the city of Malibu to evacuate. These are firestorms — towering, fast-moving walls of flames hundreds of feet high — the kind of fires that are not only uncontrolled by firefighters, but uncontrollable. In Southern California, fire burning through wind-whipped palm trees on Thursday resembled a hurricane. “This is the new normal,” Los Angeles County Fire Captain Erik Scott told a local television station. “When we have conditions like this, when it’s such incredible wind, that brings us into a different caliber.” Acting California Governor Gavin Newsom has requested an emergency presidential disaster declaration from Trump to speed the flow of federal aid to victims. By all accounts, the scrambled evacuation of Paradise was harrowing. 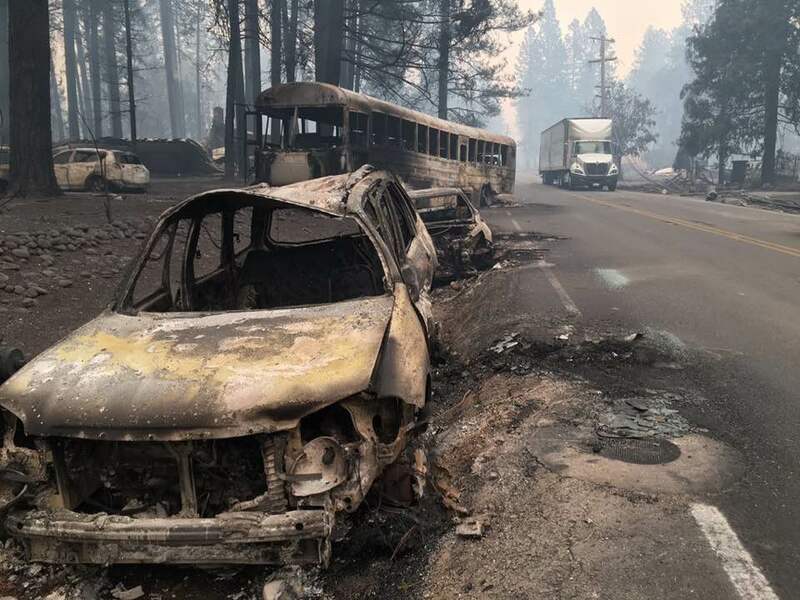 There were reports of people abandoning their vehicles trapped in heavy traffic, clutching children and running for safety under blackened skies. At least one cluster of about 70 people were airlifted from a Walgreens. Video from the exodus is nightmare-inducing, and is difficult to watch. During the height of the blaze, firefighters completely surrendered firefighting duties in order to focus on rescuing people. Smoke from the fire drifted in a huge plume and set off smoke alarms as far away as San Francisco, nearly 150 miles away. In Southern California, two fires burned near the town of Thousand Oaks with towering smoke clouds visible at the site of a mass shooting where a gunman killed more than a dozen people just hours earlier. The Hill Fire caused an evacuation of Cal State University-Channel Islands and about 1,000 homes. More worrying is the Woolsey Fire, which threatens about 75,000 homes in both Ventura and Los Angeles Counties — including the entire city of Malibu. At least one family was grieving both tragedies, losing a loved one in the shooting and being forced to evacuate because of the fire all within 24 hours, according to the Los Angeles Times. This week’s fires come just months after July’s Carr Fire destroyed large parts of Redding, California, and a little over a year after the Tubbs Fire devastated Napa and Sonoma Counties — the most damaging wildfire on record in California. Six of California’s 10 worst fires on record have come in just the past three years. After an exceptionally hot and dry summer, the vegetation in Northern California near one of the fires is the driest ever measured so late in the year. Rapidly expanding wildfires in California are part of a worrying trend across the West and around the world that is attributable to climate change. Two human-related trends are most responsible: More people are moving to areas prone to fire while hotter, drier weather is making fires blossom and spread more quickly. Wildfire seasons are lengthening as temperatures rise and droughts become more frequent. Over the past 40 years, the area burned by wildfire across the West has doubled. Globally, the surge in burning forests is making warming worse, too, expelling nearly half as much as all industrial sources worldwide in the worst years. This week’s fires, along with the countless other recent record-breaking weather disasters, send a clear message: The era of climate consequences is here. We should treat this as the emergency it is.